The metatarsals are the long bones of the foot that come right before your toes. They are relatively strong bones as they carry the weight of your body on a day to day basis. It usually takes a high energy impact such as a motor vehicle accident or direct blunt force from an object to cause a similar break to Slater’s fracture. If the bones are still in good alignment, they will heal on their own with proper rest and immobilization in a protective boot. However the pro-surfer’s injury will need surgery to realign the bones and to be set in place with plates and screws. Most broken bones usually take about 6-8 weeks to heal if treated properly. Another injury commonly seen in metatarsals are stress fractures. It is also historically known as “Marcher’s Fracture’s.” Back in the day when soldiers would have to march several miles to get from point A to point B, the stress and fatigue of wearing ill-fitting boots and carrying heavy rucksacks would cause small breaks in the long bones. This is characterized but pin-point sharp pain and swelling on top of the foot. Today, we frequently see this injury in our office in runners and other patients who work on their feet and wear non-supportive shoes. 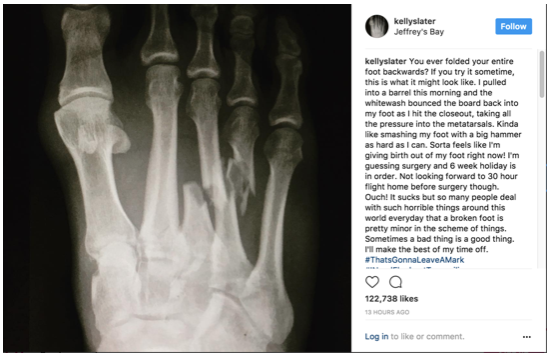 It is hard to predict an accident like Kelly Slater’s but a stress fracture is a lot easier to avoid. A custom orthotic made for your foot is an excellent preventive measure to take as it redistributes and reduces any excessive pressures to your metatarsal bones during a taxing run or long walk. Custom orthotics are made in our office and will be ready for you to wear and leave with during the same office visit. If you have any foot pain that you think might be a stress fracture or are looking to prevent one, be sure to call our office at 813-875-055 to make an appointment to see one of our expert foot doctors on staff. OUCH Gwyneth Paltrow Broke her Foot…Again?! ?